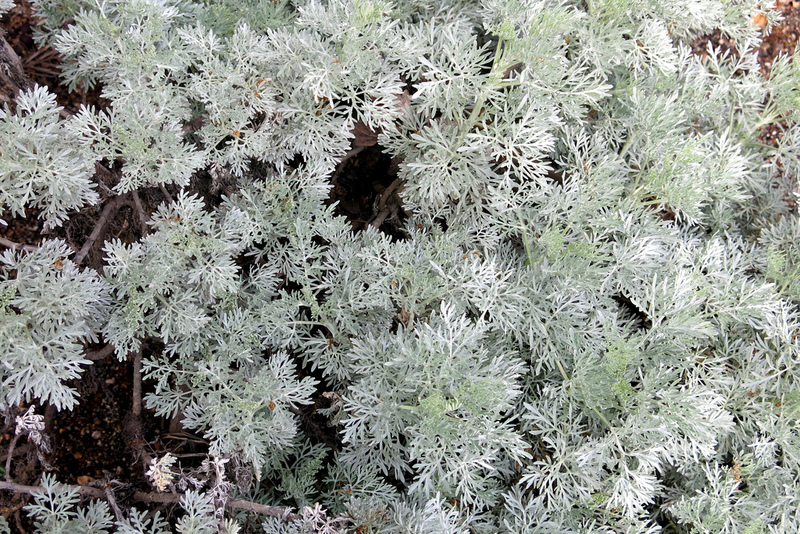 This year, the International Herb Association has chosen Artemisia as the 2014 Herb of the Year. Artemisia is a genus containing up to 400 different species of plants. Some of the more common names are Sweet Annie, Mugwort, French tarragon (Artemisia dracunculus ‘Sativa’), the decorative Artemisia ludoviciana ‘Silver King’, and Wormwood (Artemisia absinthium) to name a few. French tarragon, Artemisia dracunculus, one of the more popular herbs in this group, is a culinary herb with a hint of anise or licorice flavor. It is a member of the French herb mix ‘fines herbes’, along with chervil, parsley, and chives, and dresses up chicken, fish, eggs, and salad dressings. It does not produce seed, so new plants must be propagated by cuttings. When buying it, be sure to get French and not Russian tarragon. Many garden centers simply label their plants tarragon and you can end up with the bitter tasting Russian variety. When cooking, you only need a small amount to add a lot of flavor to your recipe. French tarragon grows in sunshine and well-drained soil, which makes it perfect for containers. Full sun in the morning and shade in the afternoon is considered by some to be the best location. It has a shallow root system so be careful when weeding. The best way to use French tarragon is fresh in recipes, by making herbal vinegar with it or by freezing the leaves in plastic bags or in an ice cube tray with a bit of water or in olive oil to be added to soups, marinades and other recipes later on. Drying French tarragon can be done but it loses most of its flavor when dried. When you come to the Spring Plant Sale at the garden, come in at the Bancroft Entrance near the greenhouses. 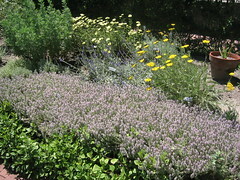 You will find a large assortment of annuals, perennials, and herbs for sale there. From 4-8 pm on Thursday, May 9, only members of TBG may purchase plants. Friday, Saturday, and Sunday (May 10 thru 12), the sale is open to the public from 10 am to 5 pm. The Maumee Valley Herb Society will have a selection of about two hundred varieties of herbs. These include both culinary and ornamental herbs. Members of the society will be there to answer questions for you and also to assist you in deciding which herbs to purchase for youre garden. Gardenn Tours with Lunch afterward. Several years ago, I attended a lecture at the Michigan Herb Associates Conference in March on making herbal liqueurs. While I found the topic interesting, the speaker really got my attention when she passed out several samples of her homemade liqueurs at the end of her talk. Thus began my adventure into making herbal liqueurs. Liqueurs are sweet, alcoholic drinks that are flavored with a variety of different ingredients. Because of the addition of water and sugar, along with fruits, herbs and spices, they have lower alcohol content than most alcohol. ‘Liqueur’ is derived from the Latin word ‘liquifacere” which means to melt or dissolve, since the herbs, spices and other flavorings are dissolved in the base alcohol. During the 13th and 14th centuries, physicians and chemists believed that herbal liqueurs could treat and prevent illnesses. Many modern medicines are based on plant extracts and some still have alcohol bases today. Benedictine is an herbal liqueur produced in France which uses 27 plants, herbs and spices. Liqueurs can be made out of most any alcohol base. Pure grain alcohol, 180 to 190 proof is the best, diluted with equal parts water. Next is vodka and brandy or Cognac, a type of brandy that is produced in the Cognac region of France. Rum, tequila, whiskey and gin are a few other alcohols that can be used. When choosing your base alcohol, remember, the better the quality, the better the liqueur. It isn’t necessary to buy the most expensive; many good quality alcohols are in the low to medium price range. It is smoothness that you want and you will not get that with cheap alcohol. If using vodka as your base, use 80-proof or 100-proof vodka and be sure you buy U.S. vaarieties, since they have to be colorless, odorless and have no flavor of their own. Use distilled water since it has no taste to compete with the flavors you use. Your fruits and herbs should be fresh whenever possible. Frozen, dried or canned fruits can also be used. The same goes for the herbs and spices that you use. The flavor of almost all liqueurs improves during storage. Fruit and berry liqueurs should be stored for at least six months for maximum taste. Cream-based liqueurs need to be refrigerated and used within two to four weeks, so make these in small amounts. Aging is essential for good quality and taste of the liqueur. it mellows the liqueur and gives it a professional quality. Liqueur making does not require the distilling of liquor, which Federal and most state laws prohibit. The base alcohol is already produced, licensed and taxed when you purchase the brandy, cognac, vodka or other spirit to be used. Making the liqueur consists of a process of adding flavors to a base alcohol to create a new beverage. It is unlikely you will have any problems if you simply add herbs, spices, coffee, tea or fruits to it to change it to a liqueur. Liqueur making dilutes the strength of the base, producing a lower alcohol-by-volume beverage. Also, liqueurs are not usually produced in large quantities; usually no more than one or two bottles at a time. “While you may make liqueurs as gifts, it is illegal for you to sell them”. The two basic methods are the steeping method and the simple sugar method. Steeping involves adding fruits, herbs and spices to an alcohol and then shaking it every few days to help blend the flavors. The simple sugar method involves making a simple sugar; two parts sugar to one part water, boiling it for a few minutes until the sugar dissolves and adding the cooled syrup to your alcohol and other ingredients. There is no “right” taste to a liqueur. Your goal is to make something you and your friends like the taste of. Add the lemon rind with pith removed. Seal and put in a dark cupboard for at least a month or two. Pour the vodka through a strainer lined with cheesecloth into another jar and add sugar, anywhere from 1/4 to 1/3 cup or more. shake to combine and put back in the cupboard. After a few days or weeks, the sugar will completely dissolve and the elderberry liqueur is ready to drink. Wash and peel the tangerines. Remove any large pieces of pith remaining on the inside of the peel. Section the tangerines and then cut each section into two or three pieces. Put the pieces and peel in a jar with the vodka, water, cinnamon and cloves. Add white sugar and shake vigorously until the sugar is dissolved. Place in a large glass jar and let the mixture set for a couple of months. Then strain and let the liqueur settle until clear. Fresh basil and rosemary can be found in the produce section of most grocery stores. The name elderberry was derived from from the Anglo Saxon Ellaern or Aeld which means fires or kindle and this wood was used to keep fires going. There were others who believed that if this wood was used, you would see the devil. The generic name, Sambucus, dates from early Greece and may be a reference to sambuke, a harp made from elderwood. Pipes were made from the branches, perhaps even the original Pan pipes. Flutes and other musical instruments were made from elderwood in countries in Eastern Europe. Elderberries, which were used more often by our pioneer ancestors than in present day are a tasty fruit that we can use in making jellies, jams, chutneys, pies, and wines. The dried blossoms are using in various blends of teas and in making cordials. Elderflower syrup made in France is used in the United States in making marshmallowa. Fanta makes a soft drink called “Shotaka” from this syrup that can be found in fifiteen countries. The Italian liqueur Sambuca is flavored with oil obtained from elderflowers. In Germany, yogurt desserts are made from both berries and flowers. Elderberries were in use as long ago as the Stone Age. Throughout history they have been believed to be harbingers of both good and evil. For example, in ancient times, no carpenter would make a cradle of elderberry wood fearing this would somehow harm the baby. In some countries, witches were believed to dance around elderberry bushes and in other countries it was believed that planting an elderberry bush outside of the back door would keep witches out of the house. Our next monthly meeting will be on Wednesday, February 20 at 9:15 AM in the Conference Center of the Toledo Botanical Garden. The program will be a “Make and Take Mini Album”. Each member should bring 10 photos that are 4 x 6 inches in size to use in making a mini album. These can be pictures of your garden, your family, or whatever. Bring a pair of scissors with which to cut and shape your photos. There is also a $5.00 charge for materials for each member. A membership directory that contains a list of all meetings for 2013 as well as information for contacting each member will be available at this meeting. The list of meetings will be posted on this website as soon as they are available. Anyone interested in herbs is welcome to attend our meetings. In large mixer bowl cream butter and sugar at medium speed until fluffy, scraping sides of bowl often. Add to creamed mixture alternately with sour cream and rose water, beating at low speed until blended. Divide dough into thirds and wrap each piece in plastic wrap. Refrigerate for four hours or overnight. Preheat oven to 375 degrees F.
On well-floured surface, roll 1/3 of dough at a time until dough is 1/4 inch thick. Cut into shapes with a floured 3 inch cookie cutter. Arrange cookies one inch apart on ungreased cookie sheets. Sprinkle with colored sugar. Bake in a 375 degree oven for 12 minutes or until lightly browned. Cool on rack. Rose hips were used in many different ways by Native Americans. They were eaten fresh, dried, cooked or roasted. The juice was extracted, boiled, and then mixed with other juices. In Alaska rose hips were frozen and stored for later use. They were also mixed with dried salmon eggs to enhance their flavor. Medicinal teas were made to use for coughs and sore itchy throats. This use was especially for babies. Decoctions of rose hips were drunk by people with rheumatism, colds, sore throats, fevers, indigestion, and kidney ailments. Rose hips were chewed by women in labor to hasten delivery. Firm hips were used as beads and made into necklaces and bracelets that were often worn by children. The rose was also used in floral designs created with materials such as dyed porcupine quills and beads made from bone. These designs were then used to decorate clothing. Originally the floral designs represented medicinal plants. These plant designs were believed to bring power and good medicine to the individual wearing this clothing. We, of the Maumee Valley Herb Society, are busy getting ready for the Toledo Botanical Garden’s Spring Plant Sale. The dates and times are Thursday, May 10 from 4-8pm for TBG members only, and Friday, Saturday, and Sunday, May 11-13 from 10am-5pm for the general public. We will have more than 200 varieties of herbal plants available that will be arranged at the sale in the following categories: culinary, fragrant, and decorative. Our members will be available to answer questions and assist you in making your purchases. Here is the list of herbs that will be available this year. In addition, you will find perennials, trees, and shrubs for sale by other members of the Toledo Botanical Garden. Come and talk with us to learn more about herbs and to receive guidance in making your selections.